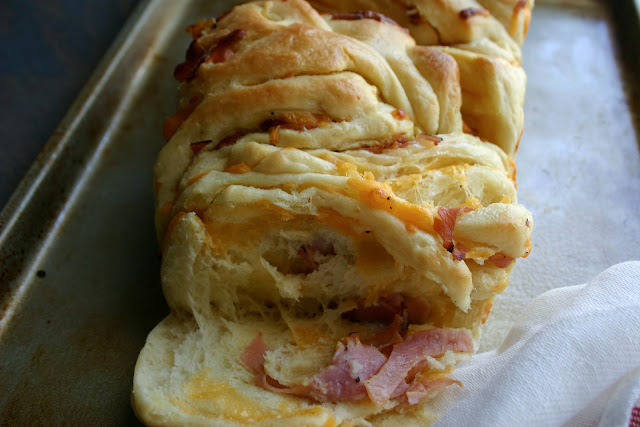 A great deal of situations can be solved with ham and cheese..
Say for instance… ….. breakfast.. lunch.. dinner..
As a kid, a ham and cheese sandwich was made daily for me... as my after school snack. 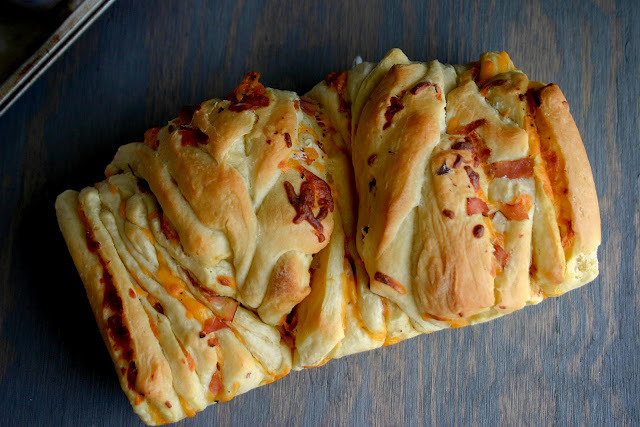 My grandmother made it using pimento cheese and tomato, lettuce and juicy leftover baked ham. 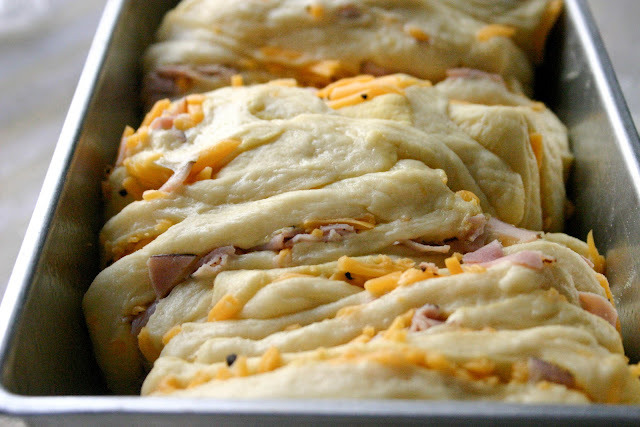 My mom went down the road of Oscar Meyer ham, that square yellow cheese encased in the coolest plastic envelope and mustard slapped on 2 pieces of Sunbeam white bread.. Even with the basic of ingredients my mom’s sandwich with just the ham, cheese and mustard always cut diagonally was hands down the best. Lately, I’ve had this crazy obsession with bread baking.. some recipes turn out better than others . But we shall discuss that at a later date..
One of my favorite breads is Pull Apart bread mainly because I feel it maybe the best thing ever created..that is at least until I bake another loaf of bread that has a better wow factor.. There is no less than.. one hundred, fifty-two thousand and 60 different variations...I have so many ideas that I can barely think of anything else to cook.. But, I had trouble bringing any of these ideas to existence until I was able to create those fluffy overlapping layers of bread bubbling over with melted cheddar cheese, succulent slices of ham and the tangy taste of mustard. 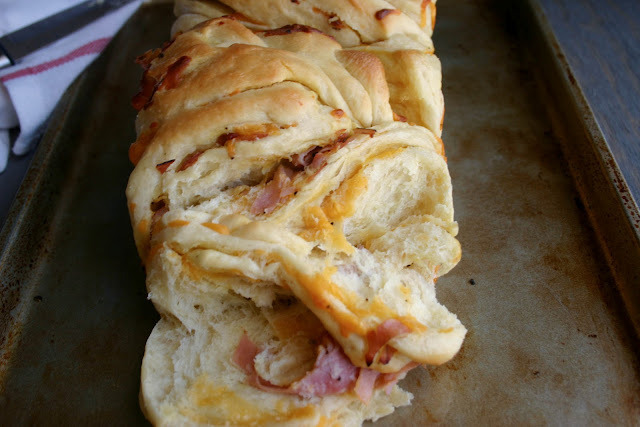 Ham, Cheddar, And Mustard Pull Apart Bread.. Using a saucepan melt butter. Remove from heat and stir in mustard, Worcestershire and hot sauce until combined and smooth. In a separate bowl combine cheddar, ham, paprika and black pepper mixing all ingredients together. Cover and refrigerate mustard sauce and ham and cheddar mixture until ready to use. 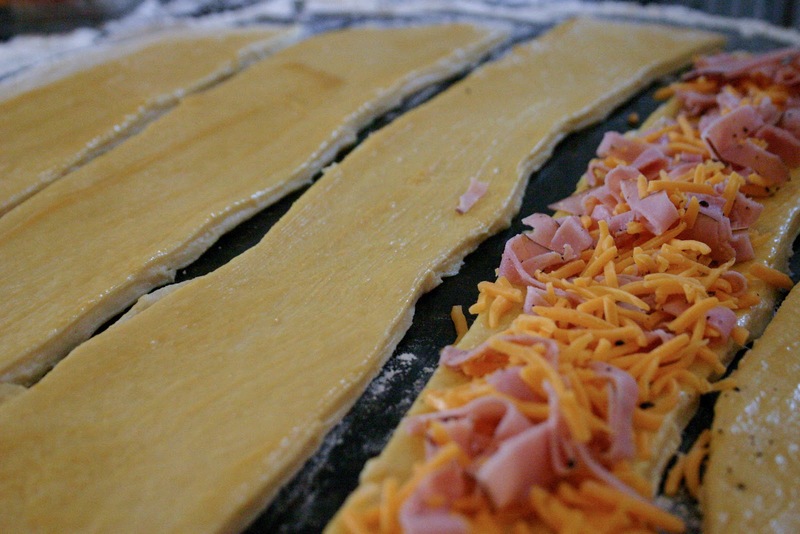 Brush mustard mixture evenly over the dough, then slice the dough vertically into 5 strips. Using a very sharp knife, cut the bread stack into 6-7 segments. 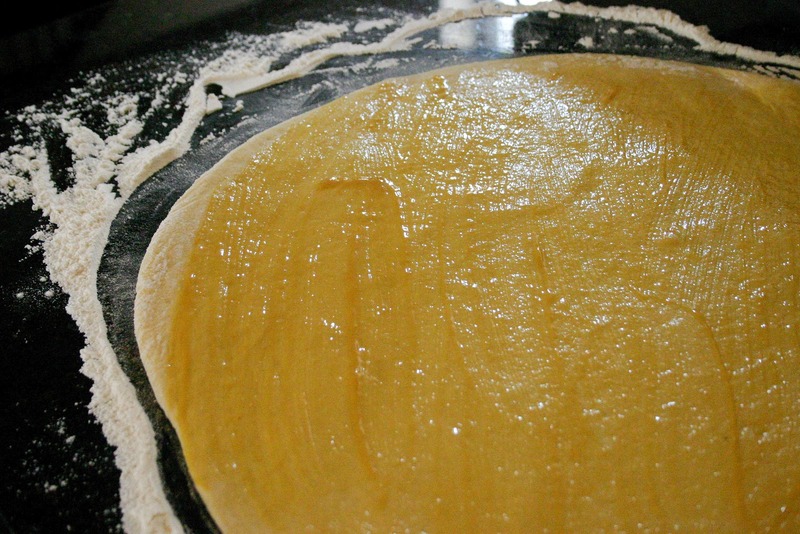 The dough will stretch somewhat as you cut it so you maybe able to get 8 segments out of it. 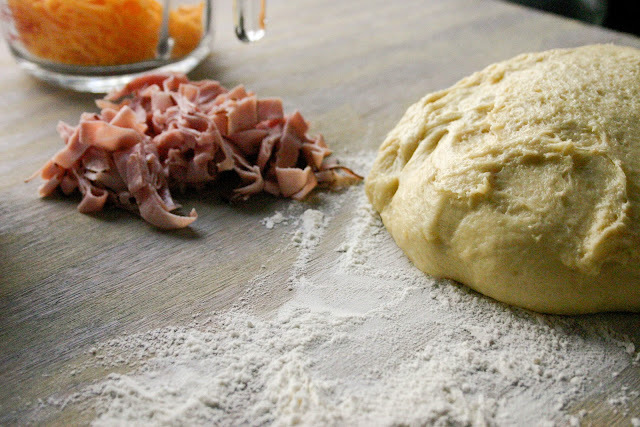 If you run out of space in the pan, just press the dough in to make room for more segments. Cover pan with more plastic wrap and set aside to let rise for about 30 minutes. 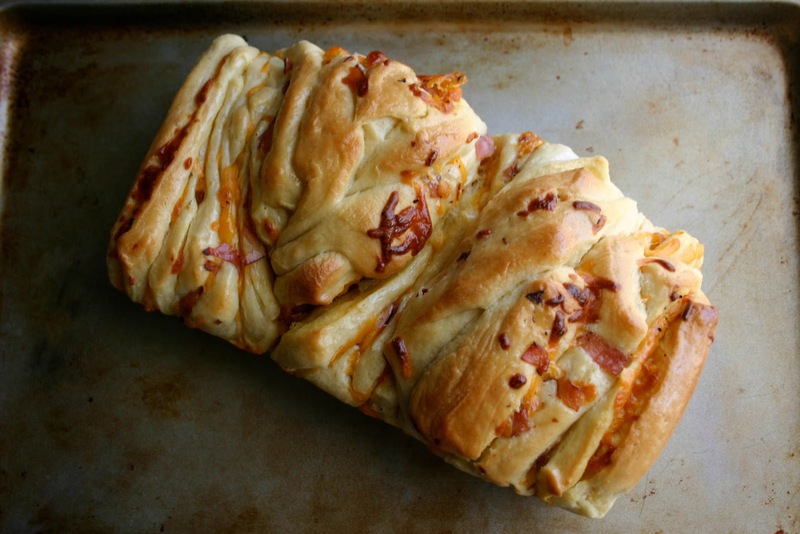 Bake loaf for 25-30 minutes or until puffy and golden brown. The dough pulls apart when warm.. so let cool for only a few minutes before serving..